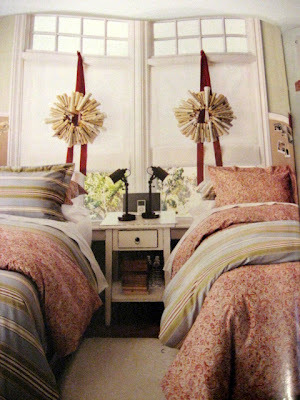 When I ran across this page in the Pottery Barn holiday catalog last year, I was immediately drawn to the paper wreaths shown hanging on the windows. So I tore it out and placed it in my idea binder. While I knew these wreaths weren't something Pottery Barn was selling, I was still bound and determined to have some of my own. 1. Cut a circle about 3-4 inches wide out of cardboard. You can use kitchen bowls to create the outline. 2. Purchase some books at the thrift store (or use some of your own that you don't mind getting rid of). The older they are, the better as far as I'm concerned. The yellowing pages add character to the overall look. 3. Cut the pages out of the book. 4. Roll up the pages into tubes, gluing the ends down so the tube still keeps its shape when you let go. Then glue the tubes to the cardboard. You can also make a bell shape out of the pages, gluing one end of the page to the cardboard, pushing the other edge of the page close to the first, creating an upside down "U"shape with the paper and then laying down another line of glue to adhere the other edge of the page. 5. 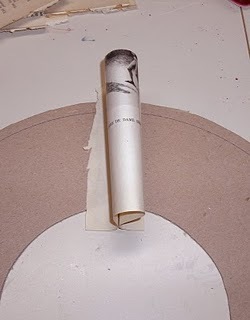 Continue gluing on the pages in various shapes until you've covered the whole circle. 6. 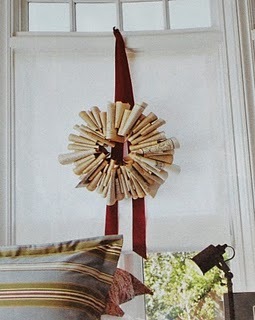 Flip the wreath over and cut a long piece of 3 inch ribbon, laying it out in the shape of a V on the cardboard. Make sure the cardboard is centered in the middle of the V, and glue the ribbon to the cardboard. You will use the bottom of the V to hang the wreath on a hook. When you're done, you'll have a unique and inexpensive wreath that looks like this.